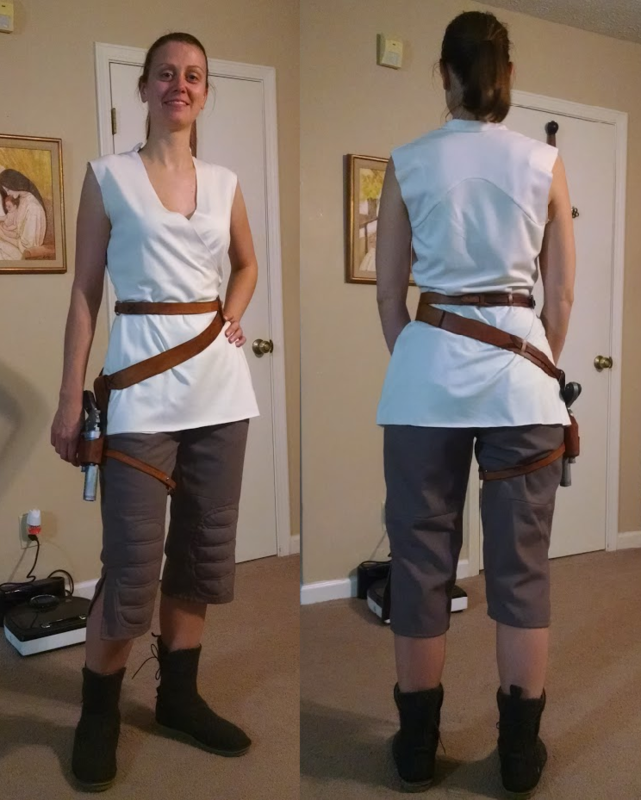 I am starting on Rey's finale costume. I'm actually building two of them, one for me and one as a commission for a friend. I've been resource gathering and fabric shopping for a while now. I've already bought the PoZu Piper boots and my husband has done a 3D print of the blaster for me. 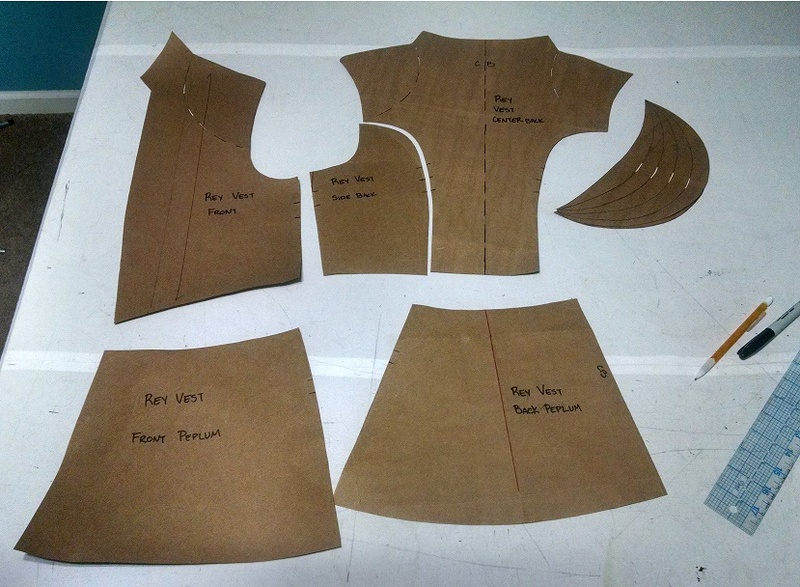 So I'm now patterning and getting ready to make the shirt, vest, and pants. 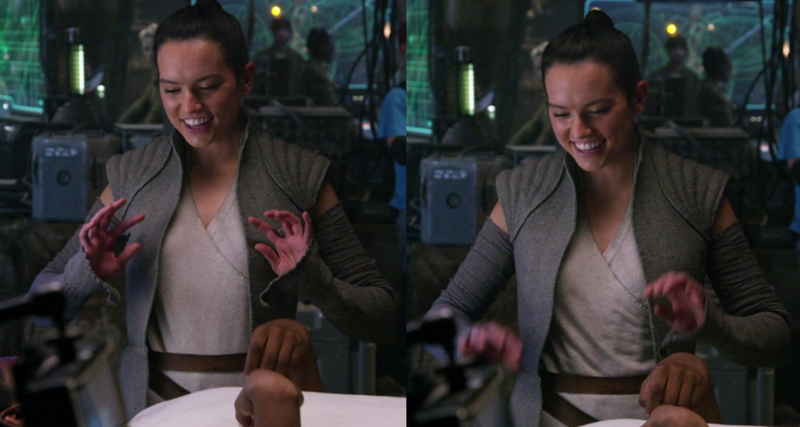 Questions I would love to guidance on: Rey's shirt. I am trying to figure out how the edges of her shirt are finished. To me, they look like they are all raw, unfinished edges: on her hem, armcyes, and center front fold-over. But then, when I look at screen caps from the BluRay, I do not see that at all. It looks like both sides are simply raw unfinished edges. So I am leaning towards doing that. I've bought a knit jersey fabric for this shirt, so I know I can leave it raw, and it wont' unravel the way a woven fabric would. I am going to do the collar and the yoke across the back as well on the shirt. The CRL that I found for this costume doesn't' comment on the edge finishing of the shirt in any way. So I think I will leave all the edges raw and unfinished. Do note as you're making the shirt that the wrap is Right over Left (from the actress' perspective). The current proposed standards by the RL judges are saying that it's Left over Right - which is INCORRECT. I've mentioned this, but it seems no one is interested in the change. And, since I can't vote, this may end up being incorrect for the costume. My wife is doing this build as well, and I'd like to know what those finished edges look like too. 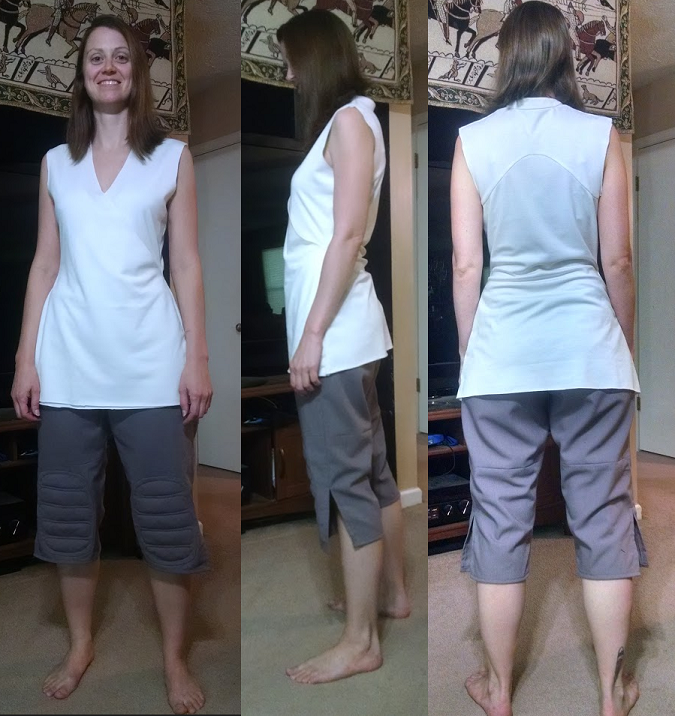 Okay, I've made the patterns for the shirt and vest, and am ready to start sewing. While I'm cutting the shirt and starting to put it together, I'm going to go ahead and prep the fabric for the vest too. After a lot of time and hunting, I'm really happy that I managed to find this fabric. 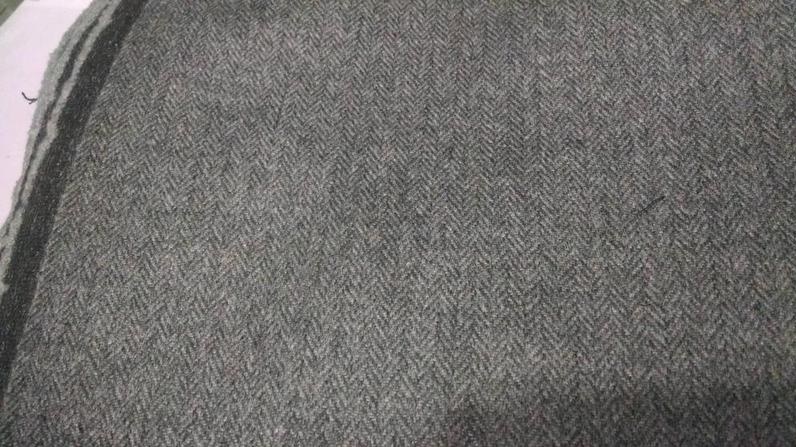 It's a wool herringbone weave wool. I feel like it's a little dark compared to what Rey actually has, but it's by far the closest thing I've found that didn't cost $50+ a yard. This beauty was $35 a yard, so a little more than $100 for 3.5 yards. So I'm going to put this through a warm water wash cycle to felt it a bit while I cut and work on the shirt. Did you figure out what type of finish is going to be on the shirt edges? 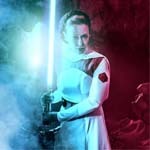 This has been up for debate in some threads that were discussing her costume on the RPF. I decided to finish the edges of the shirt collar, but leave all others raw. I actually finished it today. Unfortunately, I also completely ruined the fabric for the vest. Apparently my wash cycle agitates so strongly, that it felted the fabric waaaaay too much. It is not savalable. So that was a horrible waste of time and a lot of money. Too bad about the wool. I always test wash a swatch before putting fabric that might shrink/felt in the washer. You might be able to make a beautiful felted purse or slippers or mittens now though. Uuuggh. That's awful! Can you not still use it? 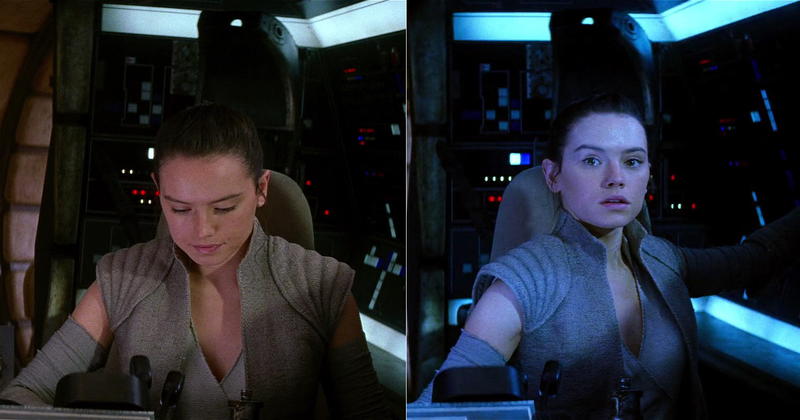 No, the fabric isn't usable for Rey's vest anymore. I think I can make a nice winter skirt out of it, though. It's super soft and fuzzy now at least! I have been told that I can soak the wool in vinegar and that should allow me to stretch it back out a bit, recover some of what shrunk up. And I can brush and shave the fuzz down to try to make the herribone visible again, but I don't think it'll be suitable for Rey anymore. I didn't test a swatch because I had done this before successfully, and also because I didn't want to run the washing machine for one small piece. Boy do I regret that now. I have ordered some swatches today from two other stores that I think will work. We'll see what they look like when they get here. 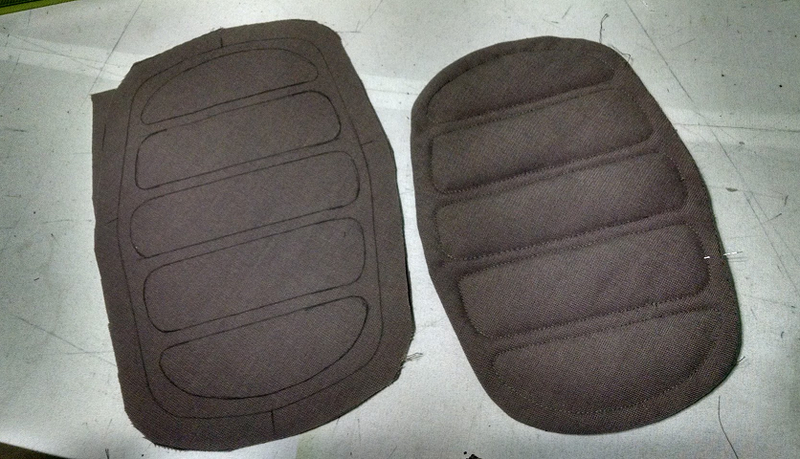 In the meantime, I patterned the pants and got the pieces cut today. I should have them together tomorrow, and then I'll work on the gun some. I've got the raw 3d printed pieces, they need to be sanded, glued, and painted. 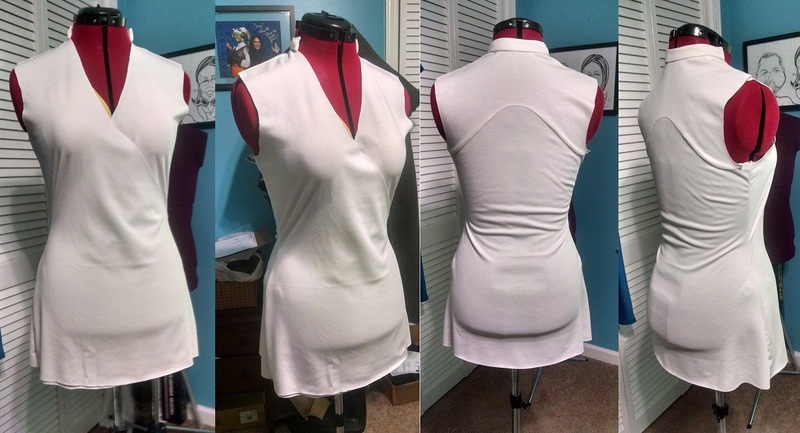 Okay, vest is still on hold while I source new fabric, BUT! 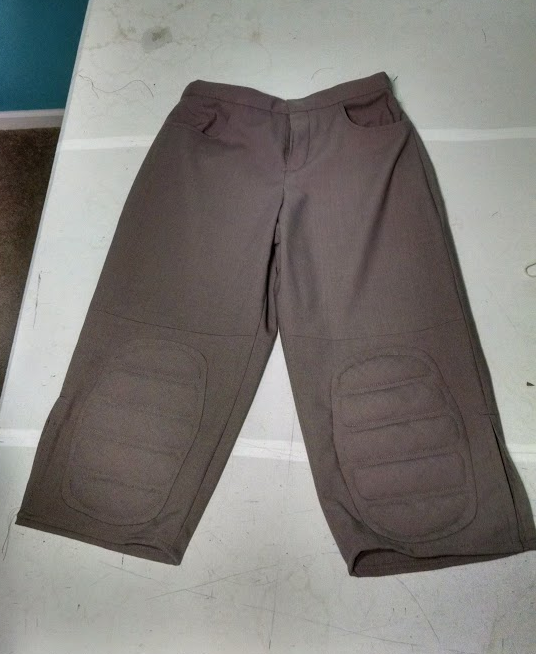 I got pants done today! Yay! And here's shots of it in progress and finished! I'm really pleased with this fabric. As you can see, it tends to look gray in certain light, and brown in other light. 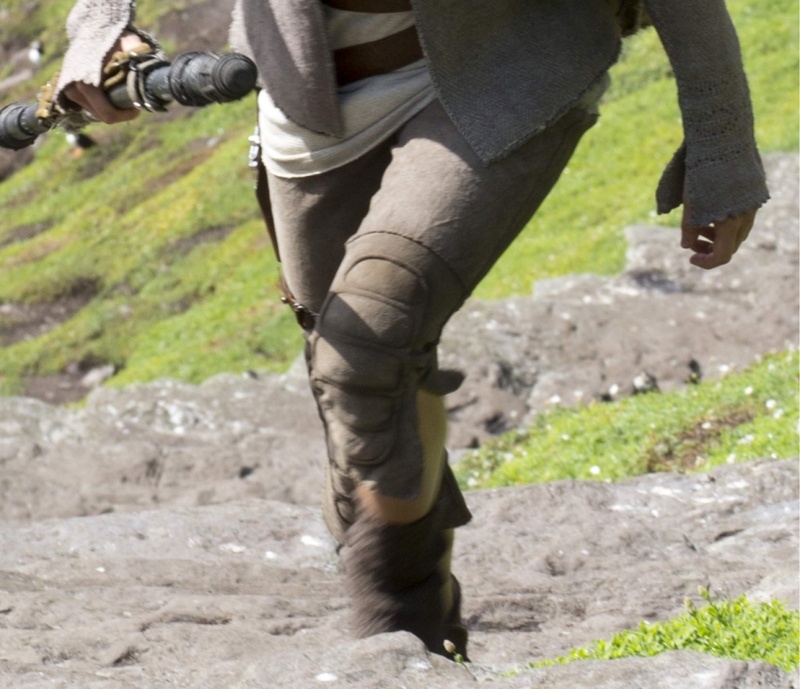 Similar to Rey's pants in the movie, I though. Swatches! They got here fast! 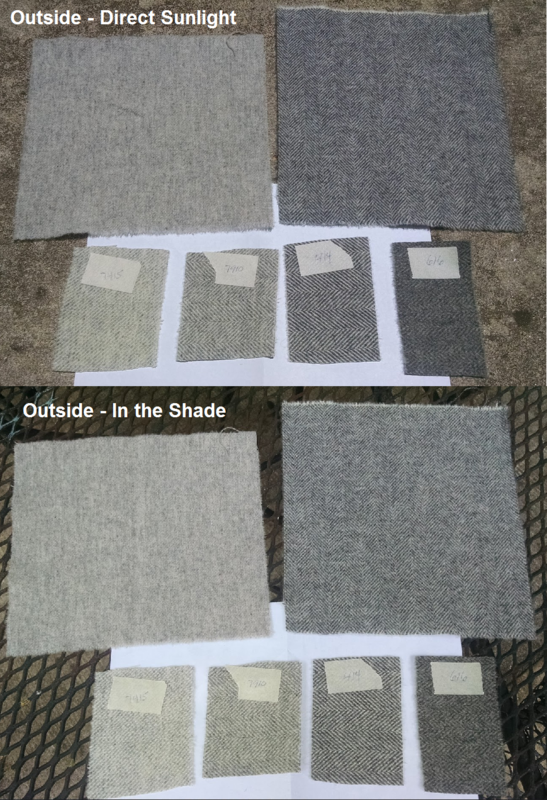 Okay, the large swatches in the top of the following photos are from Bird Brain Designs, their light grey wool, and gray herringbone wool. The smaller four swatches on the bottom are from Dorr Mill and have numbers on them to idenitfy which fabric they are. 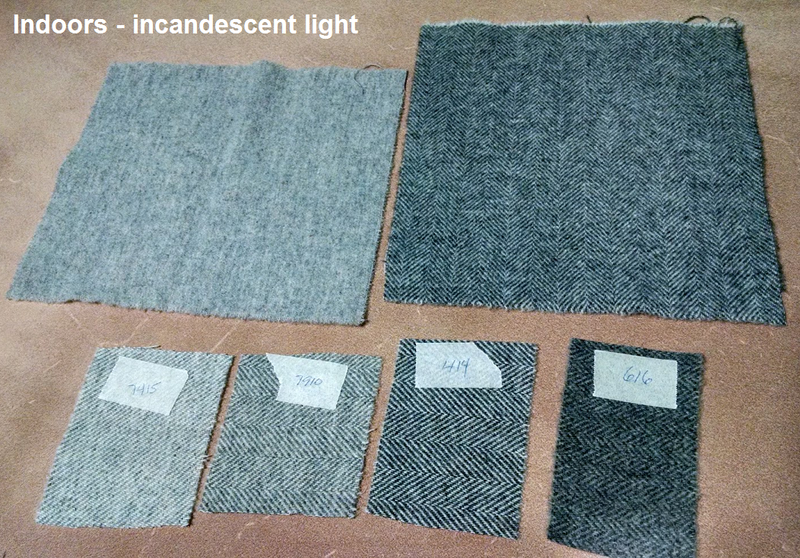 The large swatch on the left, and the left-most of the smaller swatches are both twill weaves, all the others are herringbone weaves. Here's shots of the swatches in different lighting. I'm super excited for these. They're all so pretty! and soft! I really love how subtle the weave is in 616, but unfortunately, I feel like it's a little too dark. So I think I'm gonna go with the Dorr Mill 7910, which is the second from left on the bottom. 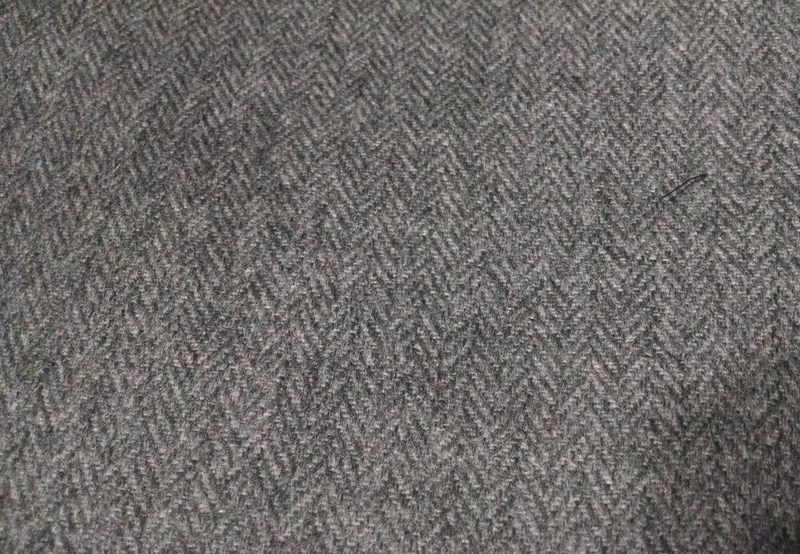 Okay, got new vest fabric on order. Ended up going with Dorr Mill's 616. I think the subtle contrast in that weave is really the most ideal, so that's what I've ordered. In the meantime, I made a gun! My husband used the 3d printer at his workplace to print me the raw kit. 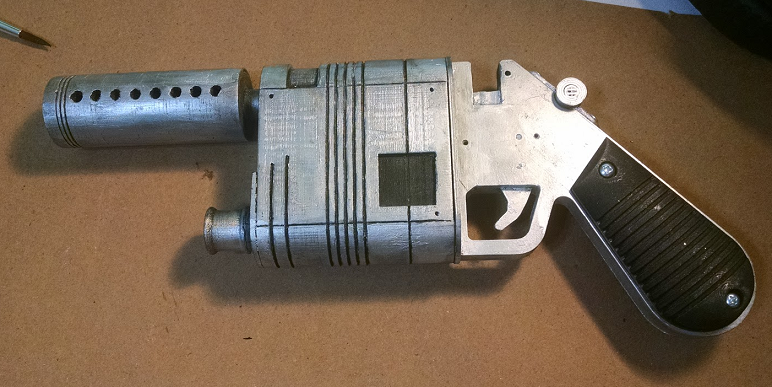 Then I sanded, assembled, and painted the gun. Still need to find a couple of screws to finish it. The ones I had bought were not the right size. 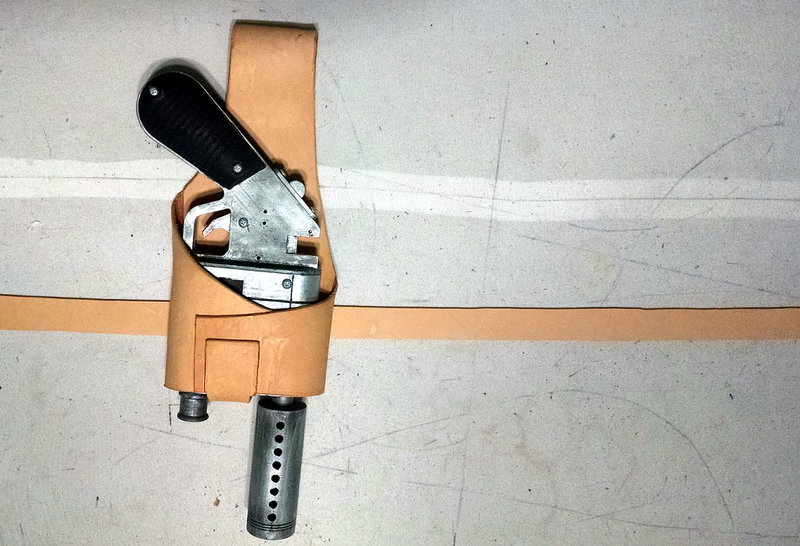 I also picked up a leather hide, so I started the belt and holster. I've got both cut, burnished the edges, and got all the folds glued. Next step is to dye both, and then just a couple of finishing touches. Thanks! 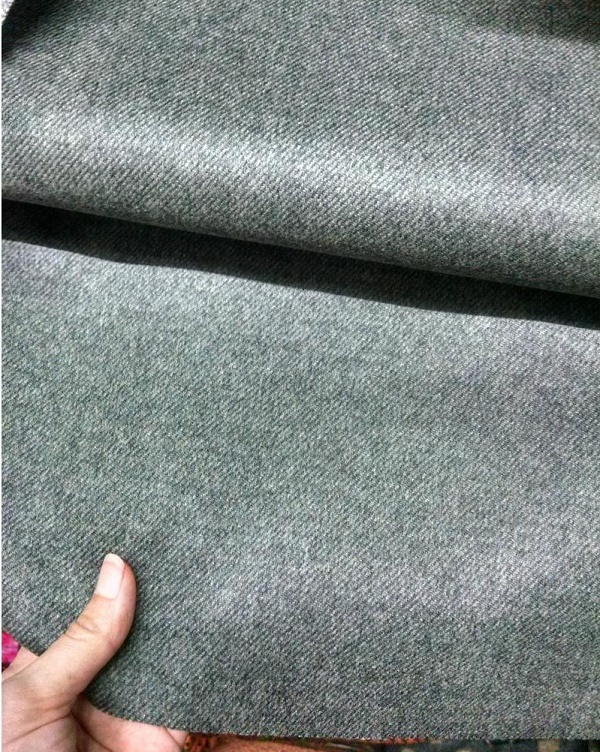 New fabric shipped out today, and after that debacal I think I'll felt it by hand in the bathtub. 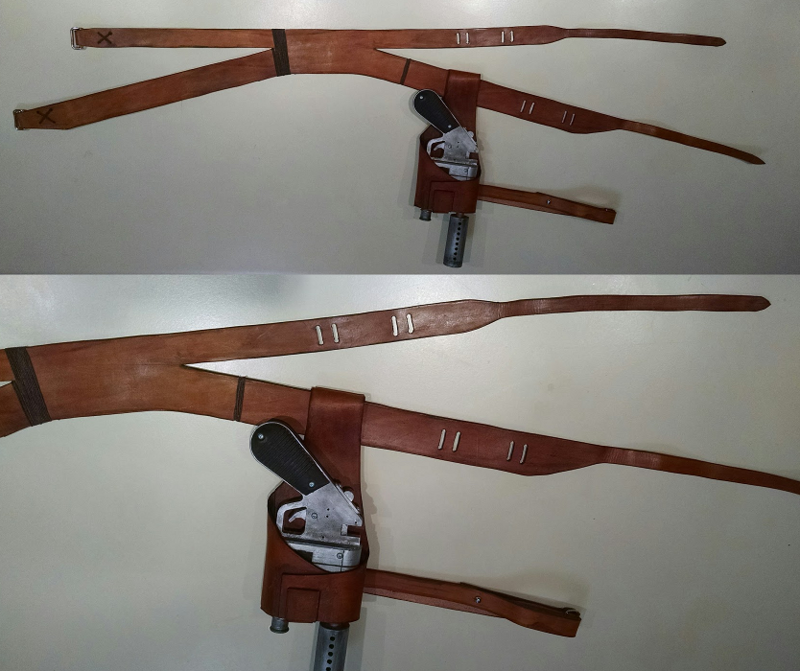 Finished the belt and holster today! So that's boots, belt, holster, pants, shirt, and gun all done. 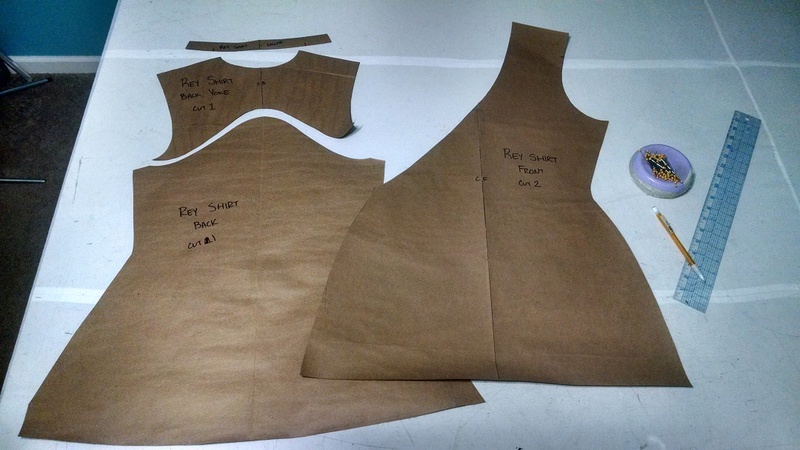 Fabric for attempt two on the vest/arm gauntlets is on the way. That leaves me with the staff and satchel to still figure out. I REALLY like your pattern for the vest. 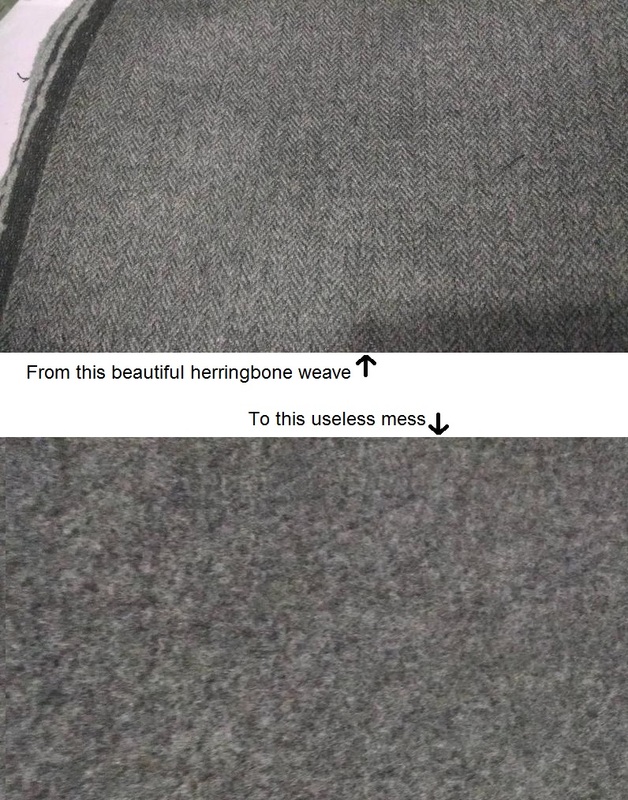 Did you end up creating that yourself, or was it modified from another pattern?